Lasse Palomaki ’16 calls himself a collector of quotations. For Palomaki, practicing excellence means returning to UNCG as an MBA candidate to continue to learn business theory, apply his knowledge practically and grow his professional network. A native of Finland, Palomaki moved to North Carolina as a high school student to study and play soccer. After graduating from high school in nearby High Point, Palomaki enrolled at UNCG as a student athlete. After graduating in May with a bachelor’s degree in international business and business administration with a concentration in human resources management, Palomaki decided to return to his alma mater. The Bryan School of Business and Economics’ mission statement, which focuses on developing problem solvers and global leaders, was a big factor in Palomaki’s decision. Additionally, he was attracted to the way the program could be tailored based on his professional interests. 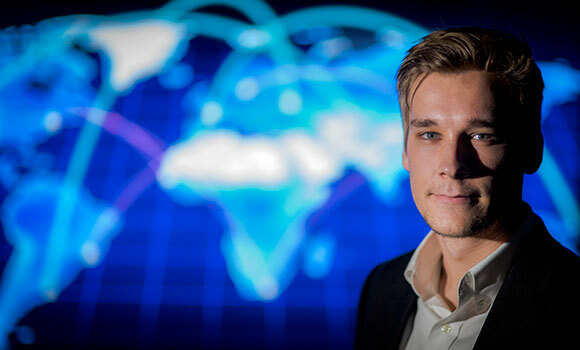 Palomaki, who wrote his undergraduate honors thesis on foreign direct investment, is very interested in international business and organizational development. He’s also looking forward to continuing the close relationships he has built with Bryan School faculty. Outside of the classroom, Palomaki will serve as student president of UNCG’s chapter of Beta Gamma Sigma, an international honor society that encourages and honors academic achievement in business. Membership in Beta Gamma Sigma is the highest recognition a business student can receive. His long-term goal? A career in organizational development consulting and, later, a doctoral degree.